Desh Bhagat University is organizing 22nd Punjab Children Science Congress on the theme "Understanding Weather and Climate" in collaboration with Punjab State Council for Science and Technology, Chandigarh. School students from all districts of Punjab are participating in this three-day event. Inaugurating the first day programme, University Chancellor Dr. Zora Singh and Pro Chancellor Tejinder Kaur urged the students to adopt scientific temperament and remain ever active to innovate and discover something new. Presiding over the function, Chief Guest, Dr. Arvind (Professor in Physics and Dean Research and Development, Indian Institute of Science Education and Research, Mohali) shared his views with the students on a number of scientific subjects and said that making consistent efforts to know about the things so far unknown is science. However, the field of science is always expending and at present very good atmosphere for scientific research is available to the students of today. By giving a number of examples, he explained to the students that just as a young child is always endeavouring to know something new, in the same way a scientist always tries to find out something new. The students evinced a keen interest in his lecture and they asked relevant questions on different topics which he answered very aptly. Director Faculty of Engineering Dr. Pardeep Singh Cheema appreciated the learned speaker for his valuable thoughts and said that such events are very useful for students and this will help in their multi-functional growth. Council representative informed that as many as 30 projects and 26 from junior category were presented by 11 districts. 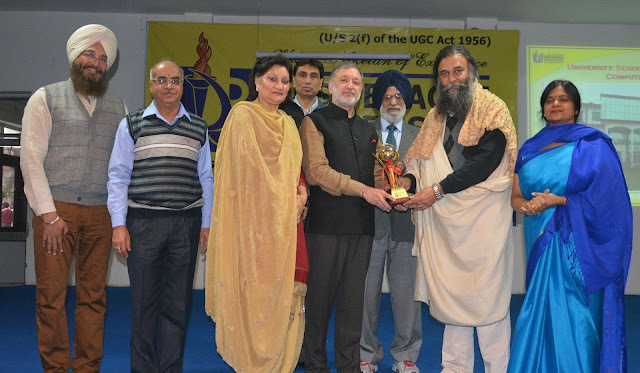 University Vice Chancellor Dr. Shalini Gupta, Registrar Dr. Virinder Singh, Examination Controller Dr. I.S. Sethi, Principals and Teacher from different schools were present on this occasion.